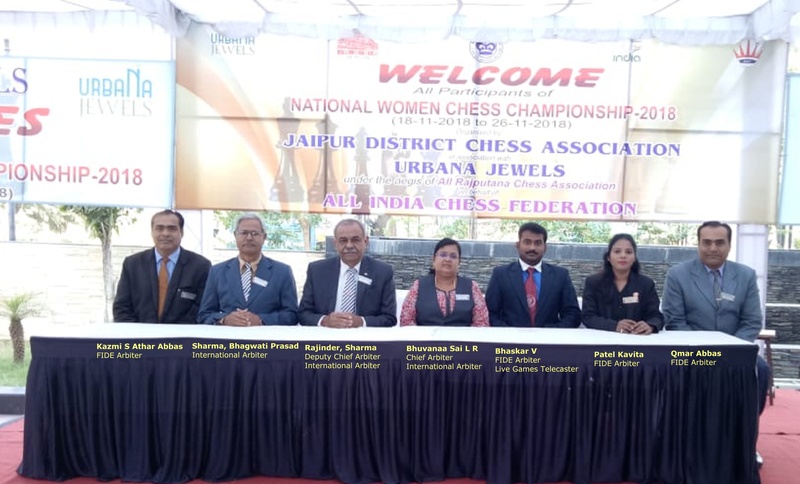 WGM Bhakti Kulkarni of Air India has won the National Women’s Championship 2018 held at The Diamond, Urbana Housing Society, Jaipur. Bhakti scored 8.5/11 palong withngwith 3 other players, but was crowned the Champion thanks to her superior tiebreaks. This is Bhakti’s first national women’s title and she takes home ₹ 4,00,000 and a glittering trophy for her exploits. Four Players completed this championship with 8.5 points at the top. 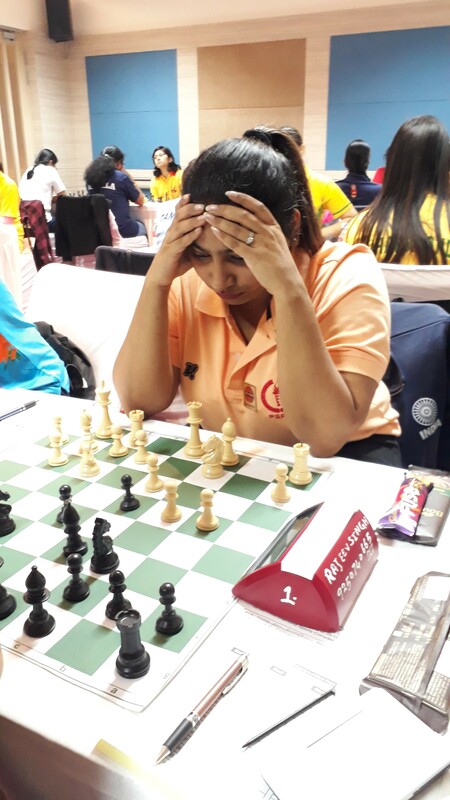 Better tie-break helped WGM Bhakti Kulkarni of Air India to win National Women Chess Championship-2018. Gomes, Mahalakshmi and Nandhidhaa are in 2nd to 4th place respectively. 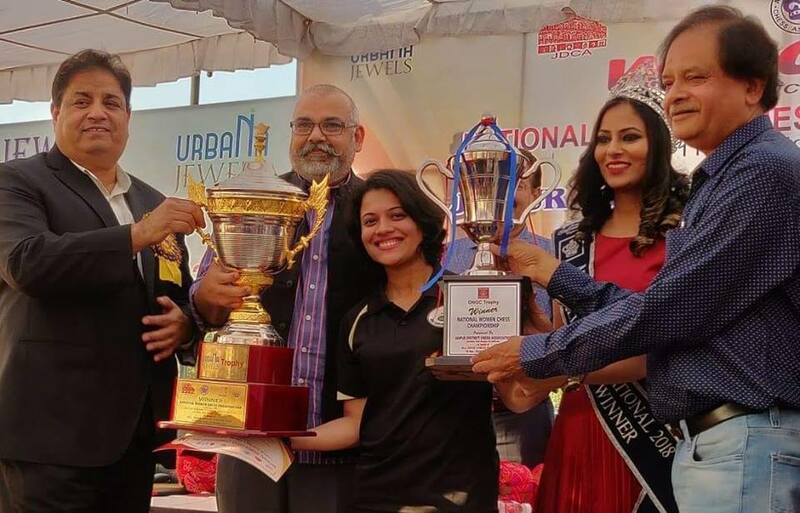 It was a mega event with the prize fund of 15 lakhs. WIM Mahalakshmi of Railways joined WGM Gomes Mary Ann of PSPB at the top. Gomes Mary Ann (PSPB) and Mahalakshmi (Railways) were the joint leaders with 7.5 points each after 9th round. Gomes beat Bhakti Kulkarni of Air India on the 1st board. Mahalakshmi of Railways won against Michelle Catherina P of Tamilnadu and joins Gomes at the top. 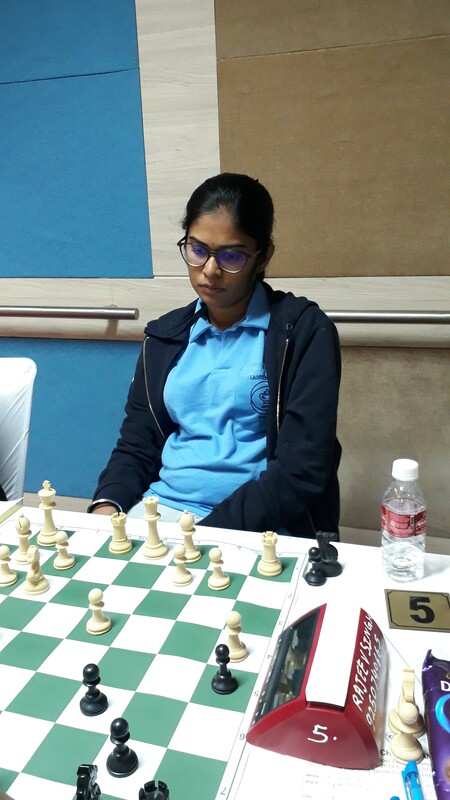 WGM Meenakshi S (AI) lost to WGM Gomes Mary Ann (PSPB) after the penultimate round. Gomes took sole lead with 8.5 points. 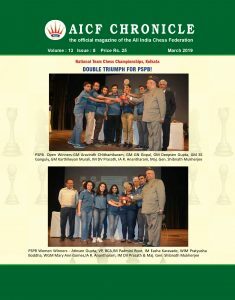 WIM Saranya of Tamil Nadu beat WIM Mahalakshmi in 50 moves. On 3rd board WGM Kulkarni Bhakti of Air India beat Tami Nadu WIM Michelle Catherina. Bhakti followed Gomes with 8 points. 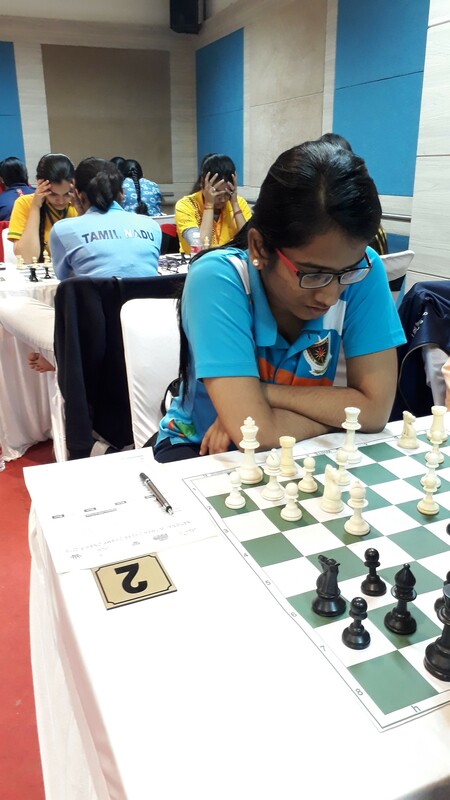 Top-seeded IM Vijayalakshmi S (AI), WIM Nandhidhaa PV (TN), WFM Saranya J (TN) and WIM Mahalakshmi M (RSPB) shares the 3rd spot with 7.5 points each. In a dramatic turn of events, overnight leader Mary Ann Gomes lost to WIM Nandhidhaa P V on the top board in 27 moves. Bhakti was the only player followed Gomes with 8 points. On the 2nd board Saranya J and Bhakti drew with each other. In the next board Top Seeded IM Vijayalakshmi of Air India lost to WIM Mahalakshmi of Railways. 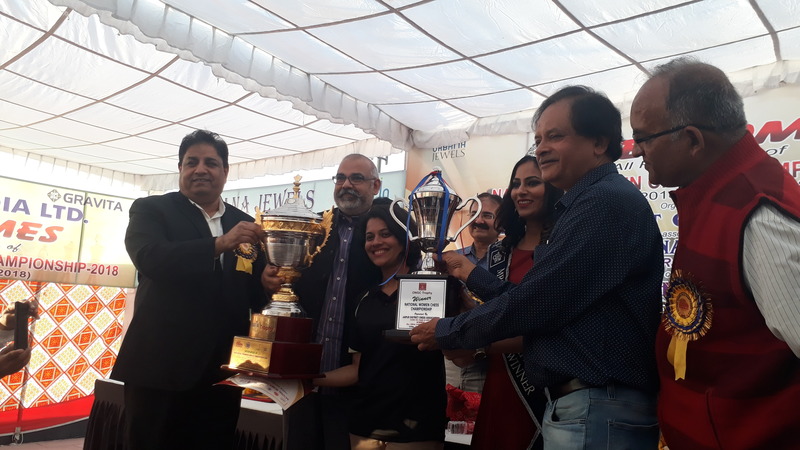 Shri Kaushal Kumbhat (Chairman, Urbana Jewels) distributed the prizes to the winners in the presence of Shri Bharat Singh (Hon.Secretary,AICF),Shri Manoj Mehnot (director, Urbana Jewels), Shri Ajay Ajmera (President, ARCA), Shri Tarun Raval (Editor,Samachar jagat, Hindi newspaper),Shri Bhaskar (MD, Jewels Emporium) and Dr. Anupama Soni (Mrs. Asia). Top 10 players and 5 best Rajasthan players received beautiful trophies. ITC (engaged Chamis division) provided gift hampers to the prize winners. Jewels era provided gold-plated chess pieces (99.99% silver) to the top 10 prize winners. The prize winners were so happy with additional trophies. Bhakti took 4 lakhs cash award with a beautiful trophy. In addition, she received another wonderful trophy which was sponsored by ONGC. 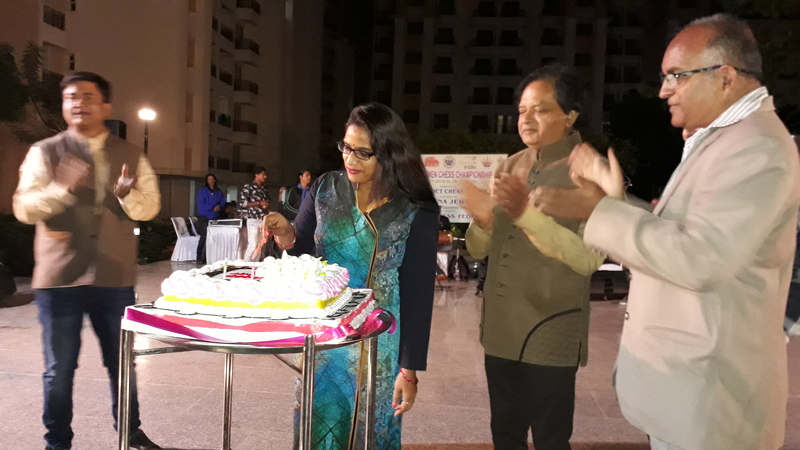 After 9th round, the organizers arranged Rajasthani Cultural Programme in the evening followed by dinner (Rajasthani traditional food) for all the players, parents, managers and accompanying persons. They also arranged to celebrate Bihar player Neha Singh’s birthday. 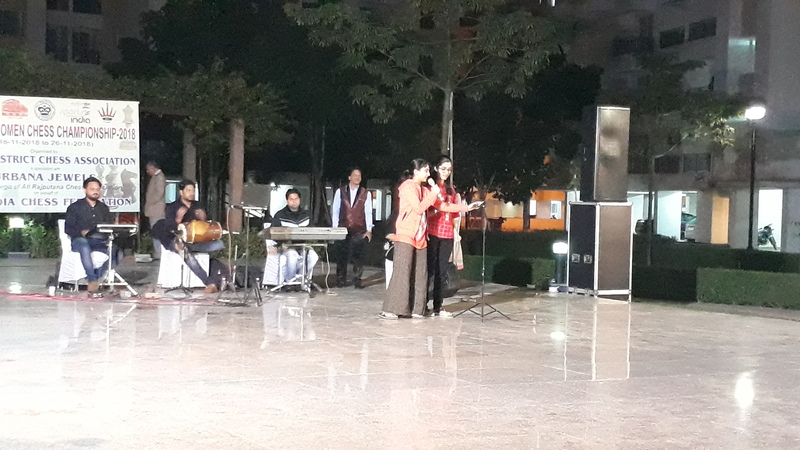 The players WGM Bhakti Kulkarni, WIM Chitlange Sakshi, Isha Sharma, and Sudha P sang a song on the stage during the programme. 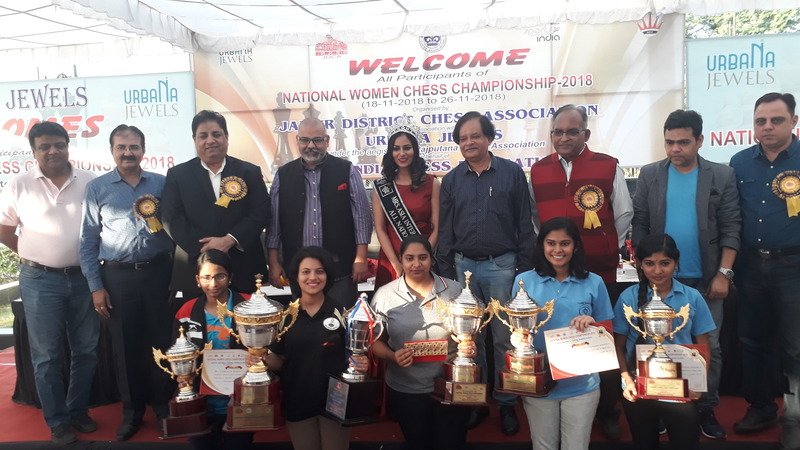 National Women Chess Championship-2018 concluded in a grand manner on 26th November with the wonderful hospitality of the organizers and excellent co-operation of players, parents, managers, accompanying persons and the team of arbiters.